Of late, the airplane has taken on inordinate symbolic weight. Its’ a 9/11 thing; passenger airlines repurposed for their destructive power seem to confirm what we previously had only suspected: that our culture contains within it the seeds of its own annihilation. The airplane then is a loaded symbol, not least when Geoffrey Farmer drags a fuselage into a gallery for use as a kind of art stage set. Yet the effect in his recent show at Catriona Jefferies’ is more melancholy than sinister. Although the prop is easily redolent of economy class claustrophobia, the stronger feelings the Vancouver artist evokes are of movie spoof hilarity, along the lines of Hollywood’s 1990s ‘Airplane’ franchise. But this is just to prove Farmer’s larger point that the art gallery is a place of no real consequence. Like a fifth column, Framer has always lurked in the shadows of his own practice. His aim is, however, not to destroy but merely express ambivalence. One constant in his work is the use of video to make literal the idea that the exhibition space is the site of something that’s already happened. So the artist has used an art gallery to show a video of himself skateboarding there after hours, or another to show video documentation of himself making tin foil sculptures with his feet. 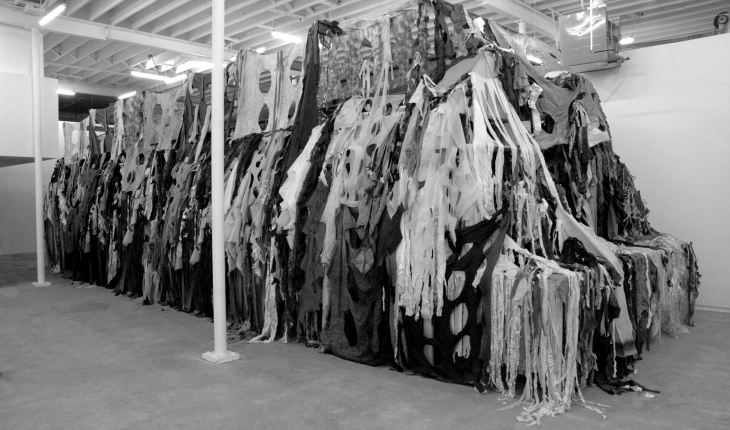 For his Jeffries’ show, the installation evolved, the viewer encountering traces of the artist’s nocturnal actions: His drawings pinned to the wall; the fuselage covered with scraps of colored fabric; the artist seen on a monitor wearing a child’s skeleton outfit and climbing a ladder. Creating layers of time and space in the gallery, Farmer reflects on the role of the artist as presence and actor: and of conceptualism as a practice that is, of necessity, always reanimated. You are currently browsing entries tagged with Catriona Jeffries Gallery at Army of YouTube.